Victoria Falls, a World Heritage Site, presents a spectacular viewing of awe-inspiring beauty and grandeur on the Zambezi River, forming the border between Zambia and Zimbabwe. It was described by the Kololo tribe living in the area in the 1800’s as ‘Mosi-oa-Tunya’ – ‘The Smoke that Thunders’. In more modern terms Victoria Falls is known as the greatest curtain of falling water in the world. Columns of spray can be seen from miles away as, at the height of the rainy season, more than five hundred million cubic meters of water per minute plummet over the edge, over a width of nearly two kilometers, into a gorge over one hundred meters below. Sussi & Chuma is the perfect location to experience the splendour and incredible range of activities around the Falls. On arrival at Livingstone Airport a Sanctuary Sussi & Chuma representative will meet and transfer you to the lodge. The transfer time is approximately 20 minutes. Sanctuary Sussi & Chuma is named after David Livingstone’s faithful companions and consist of an intimate lodge situated to make the most of the amazing views that the sweeping Zambezi River provides. 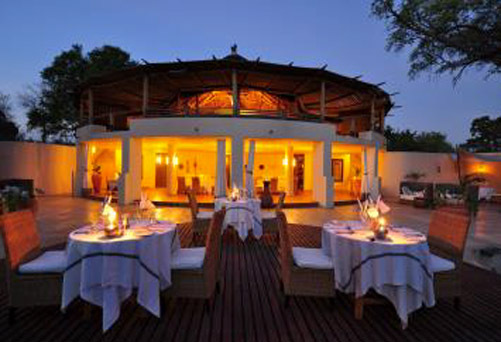 The main lodge is built on two levels, perched in giant ebony trees overlooking the Zambezi. Guests can relax in the swimming pool or the treatment room, or enjoy a drink in the elevated bar. The twelve air-conditioned tree houses are connected by wooden walkways. Each tree house enjoys superb views over the river and is an open plan room with shower, bathtub, vanity area and private toilet. Guests at Sanctuary Sussi & Chuma are able to indulge in a range of spa treatments while enjoying spectacular views over the Zambezi River. Treatments included products from the Africology line and guests are able to choose from a range of body therapies, body rituals and facial skin care treatments. Treatments may be booked at the camp reception with the camp manager.The afternoon is at leisure to enjoy the activities on offer. Activities offered at the lodge include, game drives in the Mosi-oa-Tunya National Park, where guests can see a variety of game, including white rhino, elephant, buffalo and giraffe. A walking tour of the incredible Victoria Falls, a World Heritage Site, is a must as they give guests an opportunity to experience one of the 7 natural wonders of the world. Other activities included in your stay are sundowner cruises, walking safaris, game drives in the National park and a village tour. The day is at leisure to enjoy the some of the variety of activities on offer. 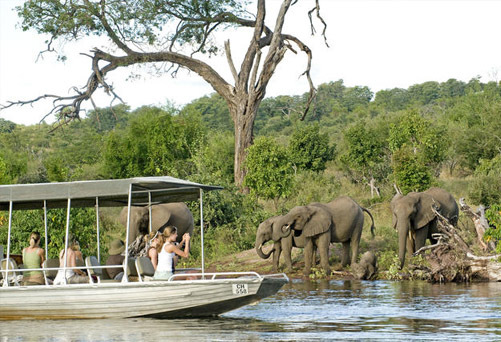 The morning may be spent on a game drive – Sanctuary Sussi & Chuma is set on the edge of Mosi-oa-Tunya National Park. Here the highly trained safari guides take guests on game drives in custom-built 4 x 4 safari vehicles to experience the land as it was when Livingstone first made his way across the ridge and beheld the smoke that thunders. The park has elephant, impala, giraffe, buffalo, hippo, crocodile, zebra in large numbers and an exciting array of birds, including some Southern African specials like Peters Finfoot. It even has white rhino – the only place in Zambia where they can be seen. Guests may also be lucky enough to see a rare sighting of the wild dog that on occasion passes through the park. The afternoon may be spent on a sundowner cruise – A Zambezi River cruise is a great way to spend a few hours before drifting back to the lodge, a warm shower and delicious dinner. Sanctuary’s boats are specially designed and the guide will take the boat through a series of grade 2 rapids, guaranteed to get exciting, and a little wet before eventually finding a spot to beach for a break or a sunset cocktail! The combination of Zambezi spray on your face and delicious white wine on the tongue, makes for a memorable afternoon sunset cruise. Sipping on a cocktail while watching the sunset over the majestic Zambezi River is truly a once in a lifetime experience! The day is at leisure to enjoy some of the many activities on offer. 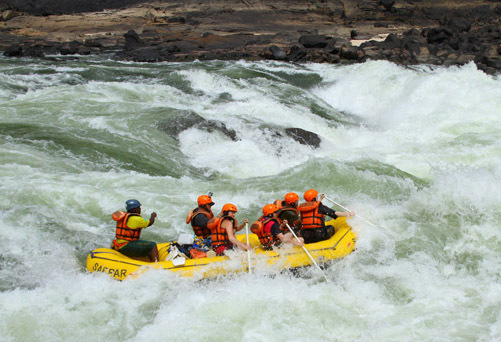 Livingstone is known as the adventure capital of Africa offering a variety of adrenalin activities. 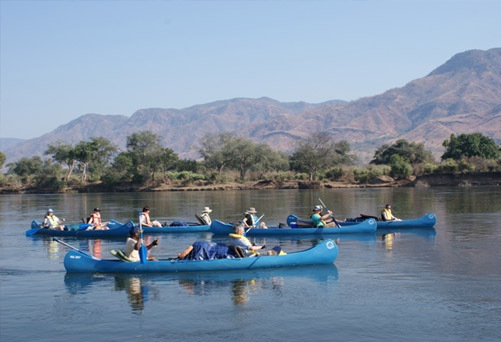 Imagine taking on the mighty Zambezi River on a white water rafting trip. The Flight of Angels offers an amazing opportunity to experience a flight in a helicopter and an unrivalled and superior view of the majestic Victoria Falls. Other additional activities include: elephant back safaris, bungee jumping, micro lighting over the Victoria Falls, Livingstone Island excursions, swimming at Devil’s Pool and a tour of the Falls from the Zimbabwean side. (Additional cost). These activities are an optional extra and can be booked at the lodge. After breakfast, a lodge representative will meet and transfer to Livingstone airport for onward journey. The drive to the airport is approximately 20 minutes.